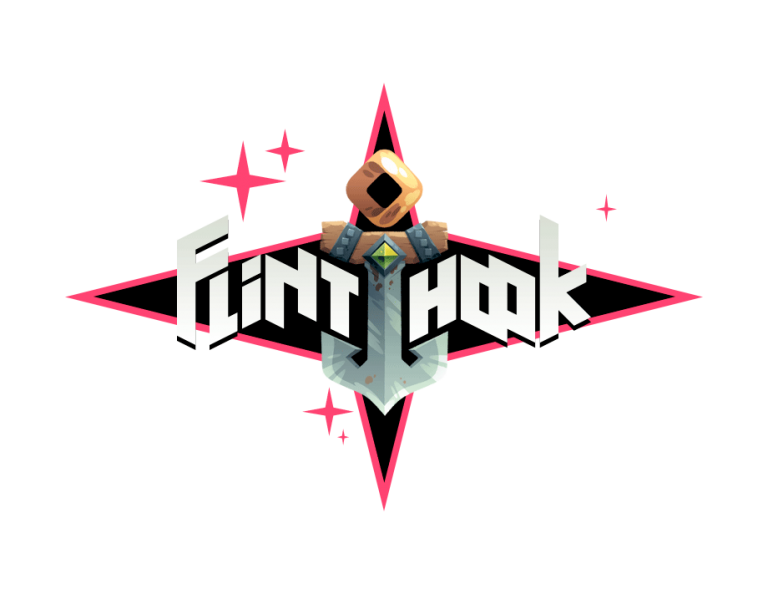 Flinthook is a 2D 16-bit styled roguelike that follows the adventures of the titular cherub-looking pirate hunter. He’s a mysterious vigilante who travels the stars with the backing of what appears to be a super natural power. His sole objective is to hunt down any space pirate bounties that are presented to him. Just imagine a pirate-themed version of Boba Fett who traded in his rocket pack for a grappling hook. 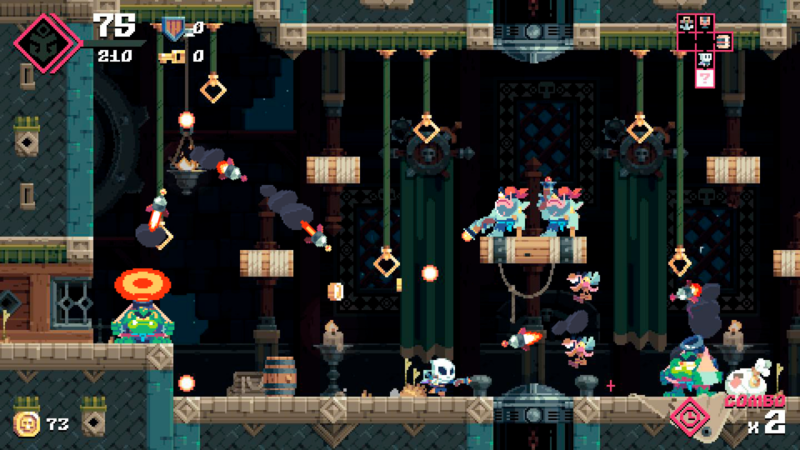 Once assigned a bounty, Flinthook must attack a variety of pirate space ships with interiors that could easily be mistaken for randomly generated dungeons. After you’ve passed the required number of dungeons, and collected the necessary doodads, the game reveals the location of your target and off you go to make poorly timed Pirate of the Caribbean references in the middle of boss fights. It’s highly possible that I was the only one doing that last part, but in my defence, I had to do something to keep my spirits up. Quoting Johnny Depp lines seemed more appropriate when compared to destroying my Xbox One to get revenge on everyone who had a hand in having me review this game. I know that seems extreme, but Flinthook, dear reader, is infuriating in its difficulty. It’s also unforgiving like many rogue-like games are, and if you can’t pass through the required number of dungeons and beat the bounty boss in one life then you will have to restart. That doesn’t mean that Flinthook is a bad game, though – even if I thought it was bad during my first few runs through the gauntlet. This is because Flinthook uses a perk system in the same way that every Call of Duty game has for the last decade. You start out as a pretty sore excuse for a pirate hunter, but as you attempt to beat dungeons you will unlock several perks that will make you better, stronger, faster, and the game a little less hard. The perks (more health, speed, better guns, etc.) are diverse enough to support multiple play styles, and some perks will even change how you approach the game in general. 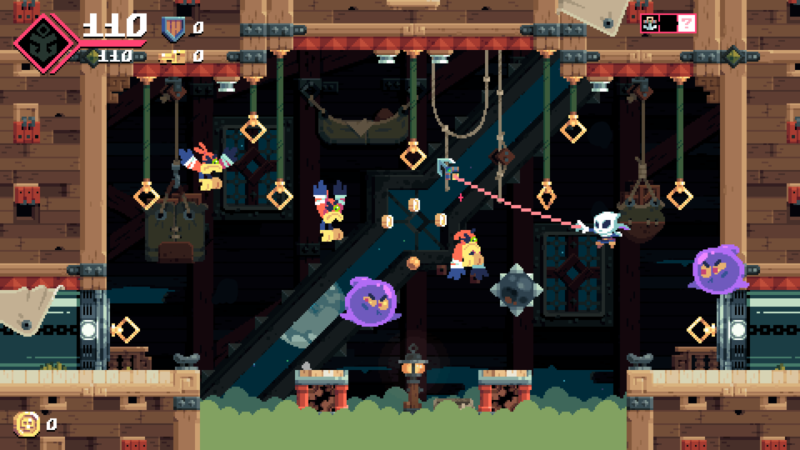 The only mechanic that isn’t affected by the perk system is the grappling hook that puts the “hook” in Flinthook; although it makes sense that the grappling hook would be in top form from the start. It’s a simple mechanic in theory; there are easy to spot grappling points around most levels, and you automatically hook onto one if you aim in that point’s general direction. Successfully beating each level requires the abilities to hook onto points quickly and accurately, and hindering that in any way would make this game unplayable. Luckily the grappling hook is fast and accurate, so much so that Spider-Man is the best comparison I could think of when thinking about the way that Flinthook flies around the rooms of each pirate ship dungeon. That said, my favorite part of Flinthook are the visuals, and what Tribute Games did within the 16-bit format. Each level does look like it could be on the inside of a futuristic pirate ship, with everything being extremely detailed. I also really love the mixture of old and new ships. Even the ship that Flinthook flies has the wooden bow of a sailing ship and the cockpit of a fighter plane. It’s an interesting combination that you wouldn’t think would work, but the positive aspects of the visual theme are reinforced every time you walk into a room that stares out into the glory of 16-bit space, planets or other phenomena. It’s a shame that the same consideration wasn’t always given to the layout of each level. For the most part the random generation of levels seems to work perfectly; although, after about 5 hours of gaming I started to get the feeling of Deja Vu. That’s not really a problem though – just an annoyance. The real issue is that some of the rooms are designed around precise jumping puzzles, and there is no guarantee that you will have the necessary perks to do that. Luckily it doesn’t happen enough to ruin the game, but (at least in my case) the most dangerous and unfair thing in the game is any room that doesn’t allow you to use the grapple hook. 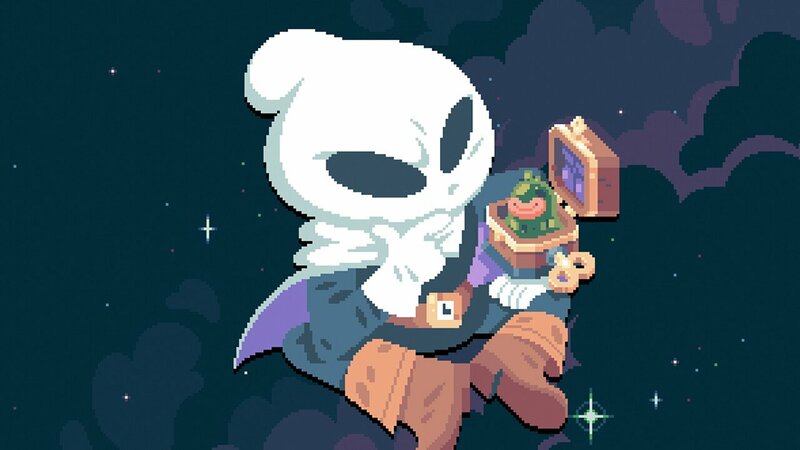 The other major issue with Flinthook is mystery, or at least the game’s fascination with mystery. When you first start up Flinthook you don’t even know what the menu options are. They unlock slowly as you make progress, and to be honest I am not sure what benefit the game gets from hiding the fact that one of the menu options is a Flinthook lore archive; however, that’s one of the many mysteries for some reason. The game is also obtuse in many areas with words like laser, battalion, danger-room, and gauntlet being used to describe what you will find in each dungeon. I know they all sound bad, but which one is the worst? Which one will make a level the hardest? You only learn what each description means from experience, and that makes finding a baseline of difficulty almost impossible in the early hours of Flinthook. I know that it is common in roguelikes to have to beat your head against the wall until you understand the gameplay, but this is the first time I had to beat my head against the wall just to know the menu options. Overall, I am a fan of Flinthook and must admit that I’m glad I played it. Although I really don’t want to admit that because it’s one rage-inducing game, and I’m playing because I’ll be damned if I let it get the better of me. I do suggest the game for people who know the difficult repetition they’re getting into, but only for those people. You will scream and curse and hate it every time you die, but you will dance like there is no tomorrow when you finally beat a bounty. If you’ cool with that then there I see no to reason to not recommend Flinthook, but anyone looking for a nice, relaxing gaming session should look elsewhere.